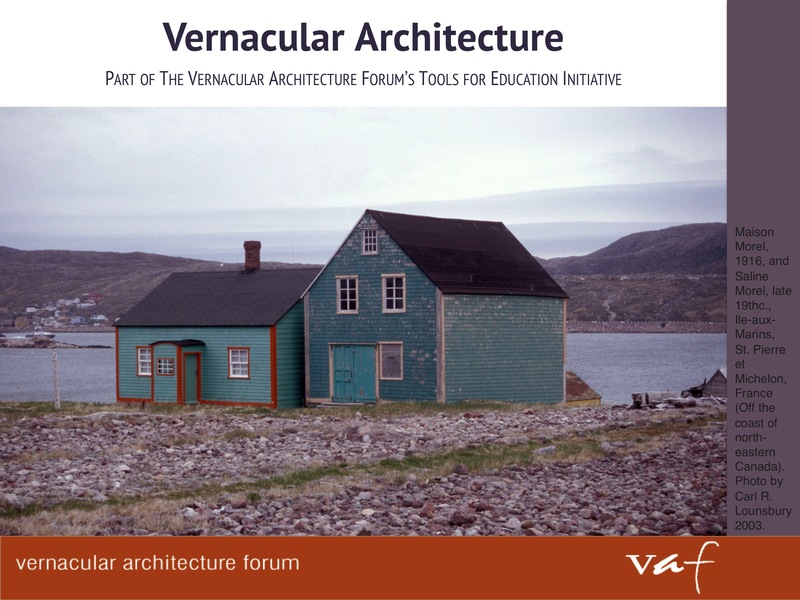 The Vernacular Architecture Forum wants to help teachers and college professors use buildings and landscapes in their classrooms. Vernacular Architecture can articulate with a lot of academic disciplines across multiple topics of current interest including historical memory, material culture, spatial visualization, GIS-related studies, place-making, urban studies, and many more. It can be difficult, however, to find resources without doing a lot of legwork and investing valuable time. To make it easier, the VAF’s Education Committee offers these visual and online resources. This page is growing so please check back often. These thematic slideshows offer high-quality fully-identified photographs and drawings of a wide range of buildings and landscapes made by VAF members in their fieldwork or taken at annual conferences. Slides include suggested narrative in the notes section. Use these as-is in your classroom presentations, cherry pick, or add your own content. This slideshow is adapted from Thomas Carter and Elizabeth Collins Cromley, Invitation to Vernacular Architecture: A Guide to the Study of Ordinary Buildings and Landscapes, Vernacular Architecture Series, edited by Diane Shaw (Knoxville: University of Tennessee Press, 2005). Each of these downloadable slideshows offers multiple high-quality fully-identified images related to a single building or landscape that visually communicate a substantive narrative. Drawn from past VAF annual conference guidebooks, the images and detailed research notes offer close readings of single buildings or landscapes that can be the basis of classroom discussion or incorporated into a lecture. This slideshow is part of the NPS’s The Power of Place program. It emphasizes intentional observation of historic landscapes and structures. This classic work in vernacular architecture studies has a new dimension. Dell Upton and others have uploaded 1970s photographs of the buildings featured in Glassie’s book to the Society for Architectural Historians image database called SAHARA. This is a subscription service available at most major research libraries. Amber N. Wiley, “Integrating Architecture into Digital and Public Humanities: Sites and Sounds + MediaNOLA,” Journal of Digital Humanities, Vol. 2, No. 2 Spring 2013. Thomas Carter and Elizabeth Collins Cromley. Invitation to Vernacular Architecture: A Guide to the Study of Ordinary Buildings and Landscapes. Vernacular Architecture Series, Diane Shaw, ed. Knoxville: University of Tennessee Press, 2005. Available on Amazon. Barbara Burlison Mooney, ed. Vernacular America: Architectural Studies from Winterthur Portfolio. Chicago: University of Chicago Press, 2014. Available as an e-Book ISBN 9780226291604. Also see our Vernacular Reading List and Syllabus Exchange.